A few months ago experimental project, Clawing, delivered one of the most grievous and distressing albums we'd heard in a while. Spectral Estate is a tight, concept piece of work which with elegance and consummate skill lays out its cinematic dark ambiance, enhanced by the spoken word delivery of Matt Finney. Multi-instrumentalist Jeff McLeod and Austin Gaines (Calques) comprise the rest of the Alabama-based trio's lineup. Offerbeest is the analog synth noise/industrial project by Dutch composer and musician, Maurice de Jong aka Mories of Gnaw Their Tongues whose unending, dark creativity is remarkable, inspiring and beyond comparison. Finney and Mories go back a long way, to when they formed It Only Gets Worse, their common side project, one of the many both artists maintain. Clawing's side plays like an anticipated expansion of their recent full length. Horror-fueled, atmospheric, profoundly poetic and well executed, the new set of four quite lengthy songs Clawing deliver, proves a consistent fresh band with vividly dark imagination, intelligence and lots left to offer. 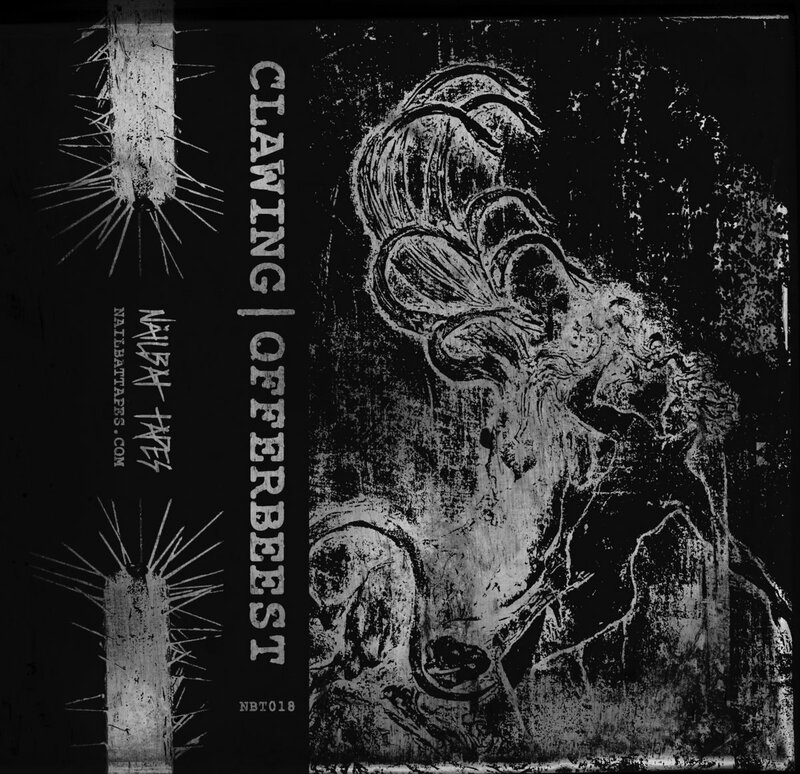 Offerbeest's side approaches a harsher death industrial sound, noisier, more aggressive, completely unconventional, and inclined toward a power electronics character, not easily digestible, yet, immersive and impossible to veer away from. While the two parts, contrasting as they are, complement each other, they devise a solid split release, a bleak, contemplative album, attacking on two fronts, as its one side targets mostly its listener's head, and the other their soul and spirit. Listen to one track from each side through the players below. Split comes out June 1st, 2018 via Nailbat Tapes.